talking about these more complex issues? Here are some of the more complex questions that teachers are asking and some answers to help teachers deal with these questions. This information has been supplied by the Tasmanian Department of Health and Human Services, Public Health Services. For more information contact them on 03 61660610. How long should children have to eat lunch at school? Children can eat up to one third of their energy intake while at school so it is important that students are supported to eat well. Not having enough time to eat can impact on the amount that children eat and drink. If the lunch break is too short, some children might eat their food too quickly, eat less than they need or even skip their lunch so they can play. Unfortunately, there is not a lot of research on how long students need to sufficiently eat their lunch. While many states in Australia have policies around the type of food and drinks that can be offered at school, there is no mention of when or how long to allow for meal times. In Tasmania it is left up to the discretion of individual schools to structure their timetable including the timing of their meal breaks. We know that having dedicated time to sit down and having enough time can help students focus on eating and their appetite and recognise when they have had enough to eat. Having a pleasant, relaxed environment can help children enjoy their food and the lunch time interactions with their fellow students and teachers. Have a dedicated fruit and vegetable break during the day to give students another eating opportunity and a chance to enjoy fruit and vegetables. Allow students to take any uneaten food from the supervised lunch break out into the playground to finish. If you are worried about litter, ask students to remove any wrapping before going outside. Have the main lunch break earlier in the day with dedicated eating time following play time. This might help children who were not eating or rushing their meal as they are eager to go out and play. The main lunch break can then be followed by a shorter break later in the afternoon. Give students a short 5 minute break on returning to the classroom following playtime to finish any uneaten food and to have a drink. Why is the primary school program changing 'Limit 'Occasional' Foods to 'Limit 'Sometimes' Foods'? The term ‘sometimes’ foods is more appropriate for primary schools, children and families. By making the change, we hope to make it easier for children to say and relate to. Many schools already use the term ‘sometimes’ foods. Children who have been part of a Move Well Eat Well – Early Childhood service would already be familiar with the term ‘sometimes’ food. Using the same word in schools means students may already be familiar with and understand the meaning. For schools whose kindergarten and LiL group are also part of the Move Well Eat Well Early Childhood Program this means the language will be the same throughout the school. Are ‘occasional foods and ‘sometimes’ foods the same thing? Yes, ‘occasional’ foods and ‘sometimes’ foods relate to the same thing – foods and drinks including chocolate, confectionary, sweet drinks, crisps, chips, fried foods and some cakes, biscuits and pastry items that are high in fat, sugar or salt. What does this change mean for schools? For schools, this change just means getting used to the new term ‘sometimes’ foods. This change is minor and only relates to the language (changing the term ‘occasional’ to ‘sometimes’). There are no changes to the requirements for criterion 3. Your school may notice that ‘Limit 'Occasional' Foods’ resources on the website have been updated with the new ‘Limit 'Sometimes' Foods’ icons and language. They are now ready to use. If your school has resources like newsletter inserts or posters saved electronically or on display, please update them with the new resources from the website. Visit the primary schools 'Limit 'Sometimes' Foods' page for updated resources. Similarly, using the new language ‘sometimes’ foods at school will help the transition. Special information for Member schools: Member schools with draft policies will need to update their policies with the new ‘Limit Sometimes Foods’ icon and language before submitting their Award Application. What alternatives to birthday cakes can I use in the classroom? If you feel that birthday cakes are a little too regular in your classroom, see below for some ideas of how to encourage tasty alternatives, or reduce the number of cakes that you have in the class. Have a monthly or term roster for making a cake, celebrate all the birthdays for one month on the same day, and make a bit of a fuss on that day. consider an 'everyday' alternative to cake such as a seasonal fruit plate with yoghurt dip or a watermelon cake. Something to consider is whether any students have allergies, or if your school has a policy on common allergens (e.g. nuts). If this is the case, a friendly reminder in the newsletter to parents/carers is an important thing to do. Grease and line the base of a 23cm square cake pan. Sift flour and spices into a large bowl. Add sugar, pineapple, coconut, banana, walnuts (if using), eggs and oil. Stir to combine. Spread into lined pan and bake for 40 minutes or until a skewer inserted into the centre comes out clean. Place on a rack and set aside to cool. Should schools be checking students' lunchboxes? Move Well Eat Well does not encourage school staff to 'check' or 'police' students' lunchboxes or make comments or judgements about the type of food provided. Children often have little control over what food is sent from home. Singling children out can embarrass them and introduce a fear of food which may lead to an unhealthy relationship with food, body image concerns, dieting and disordered eating. Equally, making comments about the amount of food a student is eating, pressuring children to eat more or less or rewarding children for the amount of food they have eaten can teach children to not trust their appetite and set up an unhealthy relationship with food. Using the Australian Guide to Healthy Eating as a reference when teaching about food and eating. This reinforces that all foods, even 'occasional' foods can be included sometimes or in small amounts in a healthy balanced diet. Using neutral language like 'everyday' and 'occasional', rather than 'good' or 'bad' when talking about food so that students can learn about 'balance, variety and moderation' without any fear or guilt. Providing students with dedicated time to sit down and eat without them feeling like they will miss out on play time. Allowing enough time and providing a relaxed environment can help children focus on eating and recognise when they have had enough to eat. Which healthy eating tool? Pyramid or Plate? Move Well Eat Well encourages you to continue to use the government-endorsed, Australian Guide to Healthy Eating in the classroom; however the Healthy Eating Pyramid could be a useful companion tool. For example if you are using the Move Well Eat Well curriculum unit, Choices! Choices! 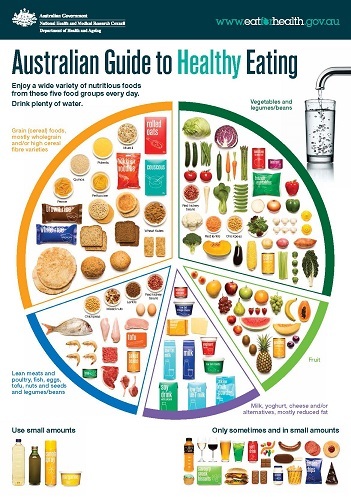 for year 5 and 6, the Healthy Eating Pyramid could be used to compare with the Australian Guide to Healthy Eating. Low carb, high fat, low sugar, 'paleo.' How do I keep up with all the new trends? Move Well Eat Well acknowledges that some children will have specific dietary needs for religious, ethical or medical purposes which will be managed by individual families. Rather than focussing on individual children and their eating habits, Move Well Eat Well aims to help schools role model and develop routines that make healthy eating and physical activity a normal part of everyday for everyone. We know that growing children have unique needs when it comes to food. Not only do they need enough food to fuel their bodies, but they also need to eat a variety of different foods to make sure they get all the nutrients needed for growth and development. Eating patterns that remove whole food groups or restrict foods may not provide enough fuel or the right amount of nutrition that a growing body needs. Recent research shows us that all Tasmanian Primary School children can benefit from eating more fruit and vegetables, choosing water as their main drink and limiting their intake of 'occasional' foods. The best way to do this is to use the Australian Guide to Healthy Eating to encourage a variety of 'everyday' foods from the five food groups which includes grain (cereal) foods, vegetables, fruit, dairy foods and meat and meat alternatives. Using neutral language such as 'everyday' and 'occasional' (rather than 'good' or 'bad') when talking about food, can also help children learn about balance, variety and moderation without any fear or guilt. Children are great imitators and as a role model, you can play an important part in helping your children develop a healthy relationship with food. Show your children that you enjoy eating 'everyday' foods and drinking water and be discreet with your personal choices and eating patterns if they are not in line with the Australian Guide to Healthy Eating. Surely some treat foods (like lollies, chips and cakes) are OK for kids? How do families work out how many are OK each day? Occasional foods and drinks, which we sometimes call "treats" or " junk food" don't fit into the five food groups. These food and drinks are low in nutrients and high in saturated fat, sugar and/or salt. If they are eaten often or in large quantities they can take the place of other more nutritious foods from the diet, which means you get a lot of extra energy but none of the goodness found in everyday foods. Kids need this goodness to grow and develop. We all enjoy occasional food and drinks from time to time, but it is easy to have too much and too many of these foods and drinks and many people do. For children and adults who don't do much activity, there isn't much room for these foods. Some people need extra energy, for example children and adults who are within their healthy weight range and who are taller or more active. It is best if the extra energy for these people comes from the five food groups (specially wholegrain breads and cereals, vegetables and legumes/beans and fruit), but sometimes it can come from occasional food and drinks. For children up to about 8 years of age who are taller or more active, occasional food and drinks are best limited to no more than 2 serves a day. For older children and adolescents, who are taller or more active it would be better if these were limited to no more than 3 serves a day. Once you think about 'occasional´ and whether it is actually "often".... you'll see the answer to the question pretty quickly! What about the Paleo Diet for children? It's being promoted by Pete Evans. We have recently learnt of a new program titled 'Healthy School Lunches', which celebrity chef Pete Evans has stated will be promoted to primary schools across Australia from 2015. Healthy School Lunches is a program based on the promotion of a version of the 'Paleo Diet'. The proposal has some major problems and has the potential to risk the health of children according to the Dietitians Association of Australian, Nutrition Australia and the Public Health Association. You can read the concerns in detail in the letter they wrote to every Education Department in Australia. Kids love crunch…so are 2 minute noodles uncooked better than crisps/chips? Both 2 minutes noodles and regular crisp/chips are high in energy (kilojoules), saturated fat, and salt (sodium). Whilst there are new versions on the market that may state they are '99% fat free' or 'made with invisible whole grains' these are still high in salt. In fact 1 brick of 2 minute noodles with the flavour sachet has more salt (sodium) than a primary school aged child needs in a day. rice crackers or wholegrain crackers such as Vita-Weat™, Ryvita® or Corn Thins. *Check your school's policy on nuts. Is it true kids should drink full fat milk? Full-fat milk is a rich source of protein, calcium, vitamin A and some B vitamins. However, it is also a source of saturated fat - the type of fat which can build up in arteries over time and increase the risk of heart disease. The Australian Dietary Guidelines recommends that children over the age of 2 years choose reduced-fat varieties of milk and other dairy foods where possible. Reduced-fat milk provides similar quantities of calcium, protein and vitamins to the full-fat version, but it contributes far less saturated fat. That means that children get the nutrients they need but less of the saturated fat they don't need. Reduced-fat milk may sometimes taste sweeter than full-fat milk even though there is little difference in the amount of sugar in these milks. This is due to reduced-fat milk having less fat and a less creamier taste. Whilst it is recommended to choose reduced-fat dairy products (including milk) from two years of age full fat varieties can be eaten some of the time. Getting children into the habit early of selecting reduced fat dairy foods encourages children to enjoy the taste at a young age and develop long term healthy eating habits. Does fruit have too much sugar for kids? Would it be better to have dairy instead of fruit, during the fruit and veggie break time? Doesn't fruit contain too much sugar? The Australian Dietary Guidelines recommends that we eat at least five vegetables and two fruit every day. We know that most Tasmanian children don't eat enough fruit or vegetables. A regular fruit and veggie break at school helps to make fruit and vegetables a normal part of everyday eating. Even though fruit contains natural sugar it is also packed full of essential vitamins, minerals and fibre that we need every day for good health. Fresh fruit is unlikely to cause tooth decay. It is sticky foods with added sugar such as confectionary and sweet drinks such as soft drinks and fruit juice that are more likely to cause tooth decay. Encourage kids to drink water with their fruit and veg break. Keep it simple – promote fresh fruit and veg – A useful motto could be "if it doesn't grow the answer is no!" Are fruits the same as vegetables? Fruit and vegetables are similar but not the same. They both contain nutrients such as vitamins, minerals and fibre. However, vegetables are often higher in some of these nutrients than fruit and lower in natural sugar. For this reason the Australian Dietary Guidelines recommends we eat at least five vegetables and two fruit every day. To make sure you are getting the wide range of nutrients found in fruit and vegetables remember to look at colour. As children we might have been told to 'eat our greens', but we now know that it's just as important to eat our reds, oranges, yellows, blues and purples too. The naturally occurring chemicals, known as phytochemicals which give vegetables and fruit their bright colours also help keep us healthy. What's the problem with selling a few sweets? We have a canteen run by parents only once a week, and we see it as a real treat for the kids. Research is consistently showing us that 'occasional' food such as lollies, pastries, chocolate and chips are not often an 'occasional' treat for children these days, but have become a regular part of their diet. Even though your canteen may only run once a week, it's more than likely that children are being offered sweets or other 'occasional' foods on a much more regular basis. Why not think about other ways the canteen can be a treat: money to spend on buying food and drinks that they can't pack in their lunchbox everyday e.g. hot milk milo or soup in winter; frozen fruit pieces or fruit smoothies in summer. Are Grainwaves the best lunchbox choice? We've had a number of parents asking us about whether 'Grain Waves' are a healthy alternative to regular potato chips. We asked the Move Well Eat Well dietitians and their response makes really interesting reading. We hope you find it useful. "Grain Waves promote themselves as a healthier alternative and make claims of having "25% less fat than regular potato chips" and being a "good source of wholegrains". While Grain Waves do have 25% less fat than regular potato chips, they still contain a fairly high 5.8g per 28g 'snack sized' packet which accounts for their high energy content. Grain Waves are cooked in high-oleic sunflower oil which is lower in "bad" saturated fat than the palm oil often used to cook regular potato chips. The biggest benefit of Grain Waves over potato chips is their use of wholegrains which results in a higher fibre content which is almost double the amount in regular potato chips. However chips would not necessarily be recommended as the best way to boost someone's fibre intake, when there are so many other lower fat and lower energy options available. So the bottom line is yes, Grain Waves are a healthier substitute for potato chips thanks to their better oil, higher fibre and wholegrain content. BUT they remain a high-energy 'occasional' snack food that is better eaten sometimes, not everyday. Some everyday alternatives to Grain Waves include rice crackers, air-popped popcorn, wholegrain crackers such as Vita-Weat, Ryvita or Corn thins, fruit buns, fruit bread, or pikelets. Should we offer sugar with cereal at our Breakfast Club? Sugar and foods containing added sugar (e.g. confectionary, sweet drinks) are considered "occasional" foods and are not encouraged as every day choices. The Australian Dietary Guidelines (2013) encourage all adults and children to "limit their intake of food and drinks containing added sugars" because eating high sugar food and drinks often, is a major risk factor for developing tooth decay. Eating food and drinks high in added sugar can also increase the amount of energy in the diet which can make it more difficult to keep a healthy body weight. Most processed cereals already contain quite a bit of sugar and adding more sugar increases the amount of energy in the meal, without giving any other benefits. Instead of adding sugar to cereal, why not try tinned fruit (in natural juice) or fresh fruit to give some sweetness, with the added bonus of fibre, vitamins and minerals. Some of my students are talking about going on diets or are non-eaters, is this OK? What can I do about it? Diets or restricted eating can be harmful for children and adolescents and it can affect their growth, development and psychological wellbeing. Often people who are thinking about dieting have a negative body image of themselves which can lead to low self-esteem, low self-confidence, disordered eating and reduced participation in sport. Teaching about the normal physical growth and development that can be expected during childhood and adolescence to alleviate concerns about any changes in body size and shape. Building a positive self-esteem by expanding student's self-identity and sense of self-worth and decreasing the emphasis on physical appearance. Developing media literacy by teaching them to critically analyse the content and meaning of media messages and reject stereotypical body image that are portrayed. Having school policies that discourage 'size' based teasing or bullying. The Butterfly Foundation provides professional development opportunities and curriculum resources specifically about body image. What's better at school, tank water or tap water? Oral Health Services Tasmania supports and recommends the use of fluoridated tap water, and would encourage the use of this consistent message for all schools. Water fluoridation is used to prevent dental decay. It is a safe, effective way of providing benefit to individuals of all ages in the community. Extensive research supports water fluoridation as an effective measure in preventing and reducing tooth decay. Fluoride does not change the taste or smell of the water. The use of non-fluoridated bottled water and tank water for drinking and cooking will dilute the benefits of water fluoridation. In recent years decay in children's baby teeth has increased markedly. The use of bottled and non-fluoridated water has grown dramatically during this period, and may be linked with increased dental decay. Ensuring the safety of water is paramount in limiting the risks associated with the consumption of potentially contaminated water. Rainwater tanks are not without inherent public health risks and require extensive maintenance and monitoring in order to verify the water as safe for human consumption. Without these measures in place the risks of illness from consumption of rainwater are increased. For more information about oral health and drinking water, contact Jenny McKibben, Oral Health Services on 03) 6214 5421. Are water fountains "banned" in schools? Drinking fountains have not been banned. Installation and ongoing maintenance of water fountains is the responsibility of the individual school. If drinking fountains are in use they should have a device installed that prevents mouth contact with the water outlet. Aren't diet soft drinks OK for children? They don't contain any sugar! Most diet soft drinks contain artificial sweetener instead of sugar, so they are not high in energy (kilojoules) like ordinary soft drinks. But diet soft drinks are still not a good choice for children because drinking them regularly still reinforces the 'habit' of choosing fizzy drinks and can teach children that they are an 'everyday' choice rather than an 'occasional' choice. Diet soft drinks, like ordinary soft drinks can also cause tooth decay. Even though they contain no sugar they are acidic which can erode the protective enamel on teeth. The best everyday drink choice for children is plain tap water.